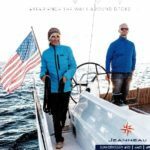 When you’re sailing offshore–Are you interested in price or cost? A client recently finished a passage on a Saona 47. 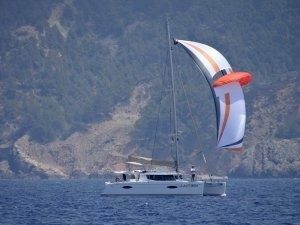 Mostly it was a great experience–especially since he was coming from extensive offshore, monohull sailing experiences. Like all passages, his was not problem free, but the issues, were primarily not the fault of the boat, but inadequate commissioning and commissioning planning, and a lack of proper training and familiarization in advance. These, issues handled properly, regarding commissioning, are exactly why ACY is so often praised for it’s perfection of the process. A manufacturer cannot make the boat perfect for every owner and every scenario–but your dealer can–if he cares and has the experience. We offer prudent consultation and bring more resources to the table than available anywhere else. We are the number one dealer in the world. We bring our extensive expertise, experience and resources to to your project–standard! Manufactures build for a worldwide market. We plan your boat just for you! You can cut corners on commissioning and get a lower price, but, in the end, as this owner found out, it cost him far more in the long run! I just returned from the Fountaine Pajot mid-year dealer meeting at ‘Boot Dusseldorf,’ Europe’s largest boat show. My good friends at Fountaine Pajot have certainly been busy, expanding production capacity to meet ever-increasing worldwide demand, continually designing and introducing innovative new models, all the while rolling out a steady flow of quality hulls for our existing clients. The hard work of this talented team is certainly not going unnoticed in the international yachting world. When considering boat comparisons, is it important to think about the numbers, especially when considering monohulls, where this is a time-honored practice. Recently, I was talking to a customer, new to sailing. He was trying to get a handle on comparing the different boats he had seen and asked me for some thoughts. I explained that the landscape has definitely changed and that there were many new design criteria being employed so that it makes it difficult to use the same old formulas in any meaningful way. Some of this is discussed in this article. Here’s a good article from Cruising World explaining some of the difficulties of comparing today’s modern designs to those of a few years ago. There are so many links out there for comparisons, but most all are now outdated by the new generation of modern, efficient, single-handed cruisers like the Jeanneau 440 and 490. This attempt to compare attributes in monohulls is complicated even further as modern designs depart still further from the previous designs. It’s like comparing your Dad’s 53 Chevy to a self-driving, modern Mercedes! How do you begin to compare features that just didn’t exist in the past? For years, things didn’t change much, but now, all of a sudden, like in the automotive industry, they have! It’s “About Time” to Pursue the Dream! 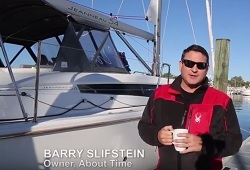 A story from our customer, Barry Slifstein, who re-evaluated his priorities and got back into boating after his father passed. Barry is a knowledgeable and experienced boater who just finished delivering his new Jeanneau 54 from Annapolis to the Virgin Islands. 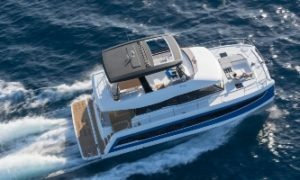 What Makes a Power Catamaran a Motor Yacht? Motor Yacht vs. Powered Yacht? It’s all about the planing speeds. It starts with the design intent. If you want to have a true, planing motor yacht, like the Fountaine Pajot 37 and 44, it must be designed with a planing hull and matching appropriate engine installation. In the case of the Fountaine Pajot 44 Motor Yacht, which is a huge volume boat, it makes sense to go with IPS drives which are 50% more efficient than a conventional power train. That translates to longer range and higher speeds for a given engine and set of conditions. Now, let’s get a little technical. At the recent Fountaine Pajot dealer meeting we had a great opportunity to meet with the developer/inventor/CEO of the watermaker chosen by Fountaine Pajot. Here’s the information right from the horses’ mouth. 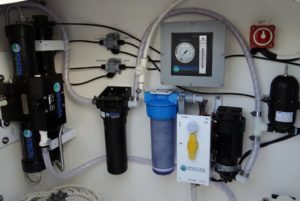 Also included, our discussion of the pros and cons of installing a watermaker on a boat set up as a business — now, vs. pre-plumbing and pre-wiring for one to be installed later. Watermakers can make your life easier on board, not only providing safe, pure drinking water, but also plenty of water for bathing, dishwashing, clothes washers and even for electric freshwater heads. The longer you’re aboard at a time, and the further afield you cruise, the more important they become. We just returned from the Fountaine Pajot Dealer Meeting in La Rochelle, France. We’ll be announcing many exciting new enhancements and changes for 2018 in the coming weeks. We are proud to announce our fifth consecutive #1 dealer award, and we continue our reign as the most experienced dealer in the network for over 26 years. Experience matters. We can be your coach and share with you the ideas and features that hundreds of other owners have incorporated in setting up their boat their way, new or used. We’ll share with you what we’ve learned over the past 26 years as we’ve commissioned hundredsof Fountaine Pajots and sold both new and used catamarans of all types.